A misfortune never comes singly, don’t you think so? If not, then you can certainly refer to Lemony Snicket’s A Series of Unfortunate Events as a reference. 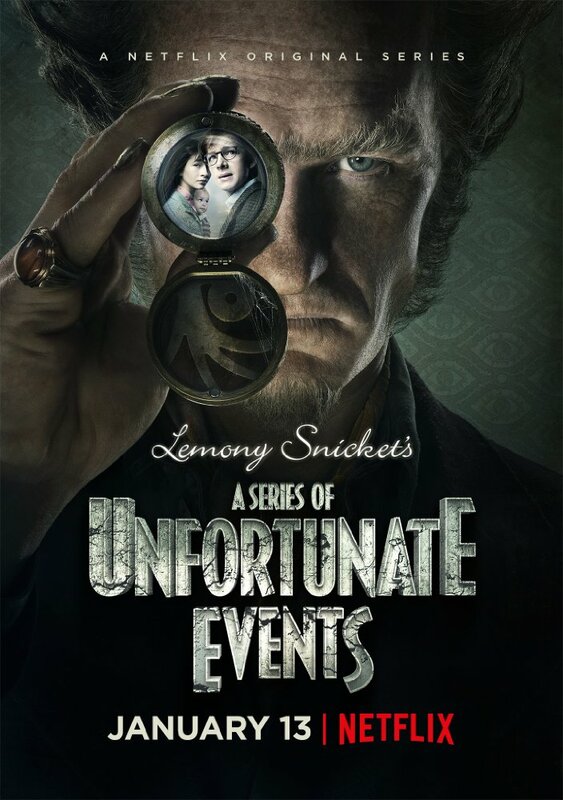 After the loss of their parents in a mysterious fire, the three Baudelaire children find themselves in a series of troubles thanks to Count Olaf (Neil Patrick Harris) who wants to take over their inheritance. However, it won’t be that easy for Count Olaf to fight against those children as they are as smart as they could get…. The series from Netflix begins with the Baudelaire children Violet (Malina Weissman), Klaus (Louis Hynes) and adorable Sunny (Presley Smith) who were too far from their home to witness the fire that takes the life of their parents (Will Arnett as Father, Cobie Smulders as Mother). It’s Mr. Poe (K. Todd Freeman) who delivers the terrible news that strikes the children. Now the children are placed in the custody of a murderous relative, Count Olaf, whose attempts, with the help of his accomplices, to steal the Baudelaire money are endless. The story, however, is being narrated by the charismatic Lemony Snicket (Patrick Warburton) who cleverly, if required, interrupts the audience from watching a particular part of the story to add his thoughts or warnings. Having a stellar cast, Netflix’s A SERIIES of Unfortunate Events is absolute fun to watch. The cast, obviously, was the best it could get. Unrecognizable Neil Patrick Harris as Count Olaf is laudable, as well as Malina Weissman, Louis Hynes and Presley Smith as Baudelaire children are outstanding, especially little Presley Smith who steals every scene she is in. With great fear of giving too much away, what you are offered by the series I can assure you, is that you will get a chance to meet a reptile fan Uncle Monty (Asif Mandvi), Justice Strauss (Joan Cusack is unrecognizable), Aunt Josephine (Alfre Woodard) and many more over the course of the series to learn that the children won’t be alone as they try to uncover a family secret and the truth behind the “fire”. In addition to that, A Series of Unfortunate Events is full of unpredictable twists, colorful scenes and enchanting environment, which you would not even expect. After watching all eight episodes within a single day, it won’t leave you with a feeling of regret or anything like that. It’s a series that deserves the attention of the entire family as a great gift or legacy, if you wish, left by an American novelist Daniel Handler whose pen name was Lemony Snicket.